It's a "Polly's Kind of Day" Fall fun starts at Polly's Pumpkin Patch! Polly’s Pumpkin Patch is a great place to get Pumpkins, fall decorations and other amazing products. But it doesn’t end there! We have lots of fun activities too! See below to find out what you can do while here. You will need cash at the hayride and corn cannon. Closed for the 2018 Season. Polly’s will again be the place for a day in the Fox Valley's best corn maze! Conveniently located, on the Eastern fringe of the Fox Valley, and a short drive from both the greater Appleton and the Green Bay areas, Polly’s offers a fun filled day down on the farm! Last year, families told us we had the best maze they have ever been thru, and again this year! Our corn maze is ready to explore and we promise your family will have a fun and exciting family outing. Our maze is designed with different degrees of difficulties, so that part of it will be easier for families with young children. And for the adventurers out there, the rest of the maze should prove to be quite challenging! 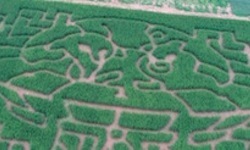 Click here to visit our new Corn Maze page! Come visit our barnyard to see our friends! Goats, cows, and pigs! Polly's is more then great locally grown produce, corn, pumpkins and corn mazes! This fall, Polly's has added tons of fun activities for kids of all ages! With fun activities like a 40 foot Slide, Duck Races, Hay Bale Climb, Corn Cannons, Pumpkin Bowling and more, Polly's offers a full day of fun to all! Please leave a donation in the box for maintaining our activities. You're never to old to be a kid, why should they have all the fun! 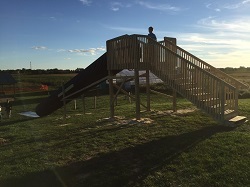 Big kids love this slide too! Even my 87 year old Dad went down it. Super fast and fun! A favorite fall tradition of many generations of families is to head out each fall and pick your own pumpkins. Now you can enjoy a tractor drawn wagon ride through the pumpkin patch and cornfields at Polly’s to heighten the experience. A perfect addition to memories your kids will have that will last a lifetime..Our wagons are wheechair accessible. PRICE - $2.00 for age 3 and up, 2 and under free! This is a short, fun trip throughout our property and stops in the Pumpkin Patch! Bring back any pumpkin for $3.00 each- no limit. Must pay for pumpkins as you get off the wagon. 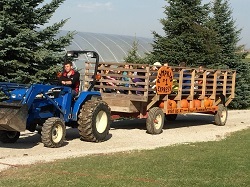 A tractor drawn wagon ride can be incorporated into your group tour. On Saturday and Sunday stop in the shop for lunch! Sandwiches vary and may include Hot Dogs, Walking Taco, Nachos ,Chicken Tenders. Serving 11:00 am -5:00pm Saturday and Sunday. Order at the counter in shop. Delicious caramel apples are made right here daily! Snacks, soda and water are available in Polly's Country Store or the Snack Shack in the Maze! Come have fun launching corn cobs at targets. No matter what age, it is fun for the entire family. The cost for this event is 1 cob for $1.00, 4 cobs for $3.00, or 8 cobs for $5.00 dollars Come on out and "Have a Blast at POLLY'S" where we have 3 cannons ready for your fun and chance to win. Get your cob in a barrel and win $50. Cash only , credit cards not accepted at the cannons.! Pay at the cannons only. Throughout Spring, Summer and Fall, Polly’s will be holding events to help you get the most of your garden, grill, or weekend in general. Events will be fun, educational and kid friendly, you can count on that. Many will contain contests like pumpkin carving, largest Pumpkin, and various baking contests. Many great photo opportunities and memory making opportunities will present themselves. To find a Polly’s Pumpkin Patch event click here. Looking for a place to bring a group for a fun day? Polly’s Pumpkin Patch would love to host your school, church, birthday, or any type of group . School tours, offered Tues- thru Fri, up to 8th grade. Chaparones are required for school groups and are admitted free of charge. Must have one chaperone for every 4 kids and must stay with the kids while in the corn maze.. Wagon rides and a pumpkin to take home can be added for an extra charge. To arrange your tour, click here and list “Tour Inquiry” in the Subject line or call Gary at 920-849-4819. Can’t wait to see you at Polly’s! Here are some fun WLUK Live remotes, showing off some of the fun activites found at Polly's Pumpkin Patch.